The only store that gives you the ultimate lifestyle shopping experience is doing it again! "Last February, we rocked the floors of Urban Athletics with Pulse Saturdays. So here we are doing it again. 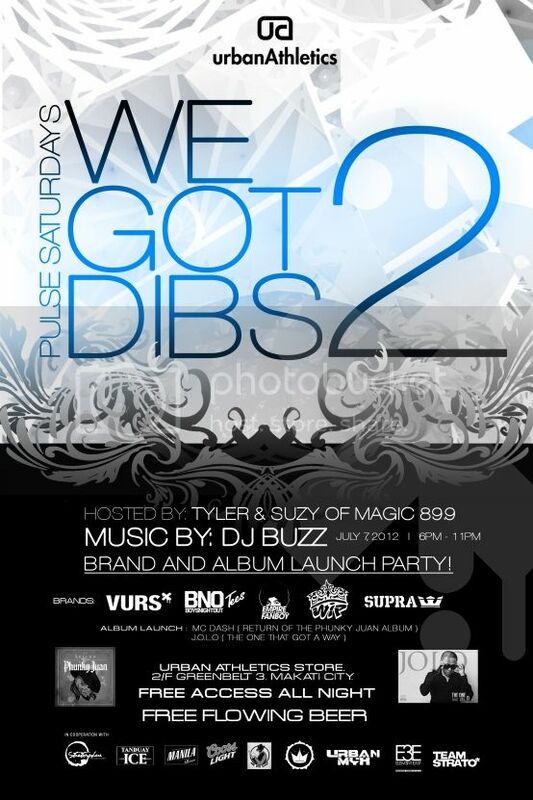 Pulse Saturdays: We got Dibs 2! An album and brand launch event happening on Saturday of July 7. If you want to experience great music and get a peek of our new brands, then come through. We got the whole night set up. There will be overflowing booze and beer pong tables ready. DJ Buzz will be spinning, MC Dash will be launching his album, Return of the Phunky Juan. So expect no dull minute and expect to party. We also got new brands dropping. Watch out for VURS Clothing and SUPRA, "Momolicious" shirts from Boys Night out, MIAMI Heat Championship Shirt from Empire X fanboy, and the much awaited "W Concords" from Wip Caps. So yes, we are streamlining the best local flavor of clothing and music. You know you should be there, or miss out. See you on Saturday! :)"
For more info peep Urban Athletics' facebook page HERE.